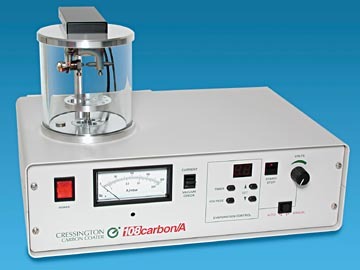 The 108C Auto Carbon Coater is one of the most advanced sample coaters available for coating non-conductive specimens prior to SEM X-ray analysis. 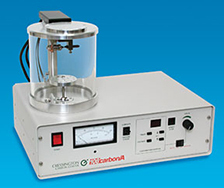 The unique feedback-controlled rod evaporation system gives multiple evaporations of around 20nm thickness without any need for rod shaping or adjustment. The high purity stepped carbon rods used in the 108C Auto deliver a superior coating quality usable at high magnifications. The 108C is a compact system, simple to operate and has very rapid pumping cycle time. 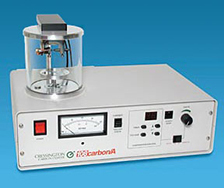 The option of the MTM-10 High Resolution Thickness Monitor allows conducting carbon films to be tailored to the exact requirements of the sample. 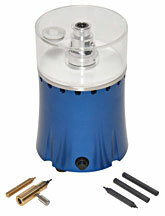 The 108C Auto Carbon Coater uses a novel evaporation supply. Current and voltage are monitored by sensor wires in the head, and the evaporation source is controlled as part of a feedback loop. The supply gives the conventional rod feed source excellent stability and reproducibility. Power consumption is low, and the source shows exceptional re-starting characteristics. 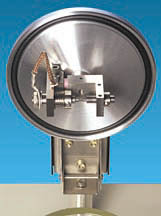 The evaporation source can be operated in "pulse" or "continuous" modes. How do the 108C Auto and the 108C Auto/SE compare? Chamber size has been increased to permit coating of larger samples. Standard Chamber 150mm dia. x 165mm 150mm dia. 120mm dia. The 108C Auto Carbon Coater offers the choice of either manual or automatic operation. 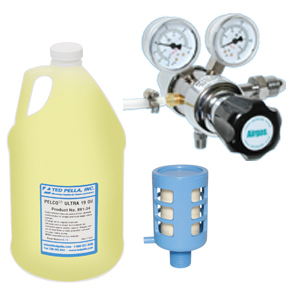 In automatic mode, the evaporation source operates as a programmed voltage for a programmed time. The programmer is simply adjusted and displays voltage and time digitally. 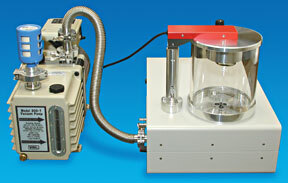 In manual mode, the unique 108C Auto Carbon Coater supply can be operated in "pulse" or "continuous" with the output voltage set using the rotary control. 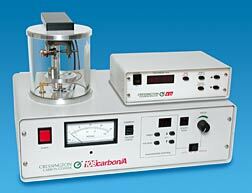 The 108C Auto Carbon Coater can be fitted with an optional MTM-10 Thickness Monitor. Resolution is better than 0.1nm for carbon. Careful use of the monitor and evaporation controller gives better than 5% reproducibility of coating thickness in the useful 15nm to 25nm range. 9602 108C Auto Carbon Coater, 115V* each P.O.R. 9602-220 108C Auto Carbon Coater, 220V* each P.O.R.